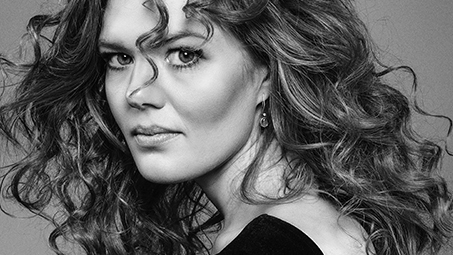 We talk to Scandinavian jazz composer and arranger Kathrine Windfeld, ahead of her performance with her sensational big band on Wednesday 19 September. I grew up in a creative and academic environment in Svendborg, a smaller town in Southern Denmark. In my teens, I channelled my creativity into painting, theatre, singing and playing the piano. At the age of 19, the piano became my primary means of expression, and I started composing. At first, traditional jazz standards and bebop didn’t appeal to me at all. Instead, I wrote rhythmically complex pieces, inspired by free jazz and world music. But, I reached a point in my creative process where I had to check out the jazz language to develop my understanding of harmonics and to improve my improvisational and technical skills. Today, my music displays a natural mixture of both influences – atonal, fiery ostinatos change with hard-swinging passages. Playing with Mike Stern was an absolute highlight. Not least because it was one of our very first concerts, so we were all extremely humbled to get this opportunity. Stern lit up the band with his energy and virtuosity, he highlighted the most important element in my music – the intensity and urge to play whatever comes out of the instrument with a powerful flow. Nowadays, the biggest pleasure is to feel how my big band is progressing musically. Even tighter themes and even wilder solos appear in live situations. And, of course, it has been thrilling to me to appear in international press like Down Beat (US), The Guardian (UK) and Le Monde (FR). What advice would you give to a young musician? My advice will always depend on the genre of music they play. I hear young musicians talking about avoiding certain kinds of music or artists because they are afraid of sounding like them. The opposite experience has characterised my musical journey: the more I have studied and listened to other artists, the more nuances and tools have settled in my musicianship. As long as you are honest about your taste and what appeals to you, you will never lose track of your own sound. No matter how much you listen to Coltrane, you will never become an exact copy. You are born in another era, your physiology, surroundings and references are very different. What can we expect from your concert at Turner Sims? We will play a selection of our best pieces, some new, unreleased tunes and some of our strongest classics. We always strive to deliver an intense and varied concert – from lyrical ballads to hi-tempo punk themes.